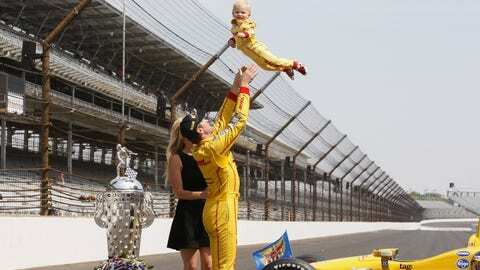 Baby Ryden smiles as Indianapolis 500 winner Ryan Hunter-Reay tosses him into the air. When 18-month-old Ryden Hunter-Reay sees his Indianapolis 500-winning Dad put on his bright yellow DHL firesuit, he thinks it’s a "magic suit." "He freaks out every time he sees me in it," Ryan Hunter-Reay told FOXSports.com "He thinks I’m Mickey Mouse or something. I’m about as cool as Mickey Mouse when I have my ‘magic suit’ on." In the last month since Hunter-Reay’s dramatic Indianapolis 500 victory, it has certainly been a magic ride for the Hunter-Reay family, especially for the blonde boy who, at times, has overshadowed his father’s Indy 500 win. The fact that young Ryden was the star of the show on the Indy 500 Victory Tour was just fine to this year’s winner. "Everybody loves seeing a cute baby â let alone one in a firesuit," Ryan said. "He’s our world and it’s great to see him getting some attention when he has that firesuit on." For the biggest race of the year, his father came up with a great idea that would give the toddler a "magic suit" of his own. "The thing with Ryden’s suit was all Ryan’s idea," said Beccy Hunter-Reay, Ryan’s wife and Ryden’s mother. "The whole idea about the firesuit was not for media attention, it was because Ryden loves his Dad’s suit. "When Ryan re-signed with the suit manufacturer, he said when they make his suit they need to make one for Ryden, too. It just happens that it showed up the Saturday before the Indy 500. We had to order through Italy and asked for a 2-T but in Italy they don’t know what a 2-T is. They asked for measurements and we actually gave them measurements for him to grow into it and when it arrived it fit like a glove. "He is just so funny on pit lane. He is like this little character and he had his ‘magic suit’ on so naturally he stole the show." Ryden’s reactions and facial expressions following the victory were priceless and could not be scripted. He passed on the traditional drink from the bottle of milk that goes to the winner of the Indianapolis 500 and, when grown adults were bending down to "Kiss the Bricks," well … Ryden didn’t know what to make of that. Michael Andretti, Ryan Hunter-Reay and Beccy Hunter-Reay kiss the bricks while Ryden doesn’t. "When he wouldn’t drink the milk, that is something he is going to regret later because he drinks everything that we drink, whether it is Coconut Water, Sun-Drop, Snapple â he wants it," Beccy said. "For him not to drink the milk is so crazy because he always likes his milk even in a Big Boy cup. "With all the chaos that was going on he could have reacted by crying but he loved every minute of it. He is so funny. He is just a cute little kid. He has our personalities where we are both very mellow people. He took in every minute of it and enjoyed it, I think." After the Victory Lane celebration, the winners were whisked off to the Pace Car convertible for a lap around the Indianapolis Motor Speedway so the 300,000 fans could salute the winner, and the Hunter-Reay’s could wave to the fans. "I was a little nervous about that because not having him in his car seat makes me a little nervous," Beccy admitted. "He actually enjoyed the breeze in his air. It was crazy because everybody was chanting ‘USA! USA!’"
And then came "Kissing the Bricks" â a tradition that actually began with NASCAR driver Dale Jarrett after he won the 1996 Brickyard 400 at the Indianapolis Motor Speedway, but has became adopted by every winner at the Speedway in recent years. "I think the funny thing is whenever he’s on the ground or playing on the ground, I’m always telling him to get up off the ground and now he is looking at his parents kiss the ground and he was wondering what is going on here?" Beccy said. On Memorial Day, the Hunter-Reay’s were back at the "Yard of Bricks" for the traditional victory photos, and there was young Ryden, back in his own "magic suit" with a huge smile on his face as his father tossed him in the air, feeling as if his "magic suit" could make him float on air like a superhero. "The two of them in their magic suits, I think he thought he was a superhero at that point," Beccy said. Then it was off to New York for more of the Indy 500 Victory Tour with Ryden as the star attraction. "The Today Show wanted Ryden but said it was O.K. for him to bring along his Indy 500 winning Dad," Beccy recalled. "Matt Lauer and the whole crew were in love with him. He definitely stole the Today Show. We were only on there a couple minutes but he was taking it all in like a good little monkey. They asked if he was going to be a race car driver and I told them I hope he is going to be a golfer. That would be easier on me. "That was awesome and then, when we went to the New York Stock Exchange, Ryan rang the bell but Ryden really wanted to ring the bell. He was still smiling and happy and clapping his hands." In many ways, Ryden was the big hit of the Victory Lap but, even in an ego-driven sport such as auto racing, the winning Indy 500 driver didn’t mind. "Ryan has no problems with getting upstaged by Ryden," Beccy said. "I think Ryan is loving every minute of it. As a family it’s an awesome way to celebrate the win. "It was Ryden’s Victory Tour and his Dad got to come along for the ride. It’s an added bonus to have this little guy because he looks just like him." As Beccy was holding young Ryden in her lap on a golf-kart, almost as if on cue, Ryden grabbed the steering wheel and said, "Dada, Dada…." It’s been quite a magical ride, especially for one little boy in his own "magic suit."